Rejuvenate Your Skin with new micro-pigmentation treatment technology. 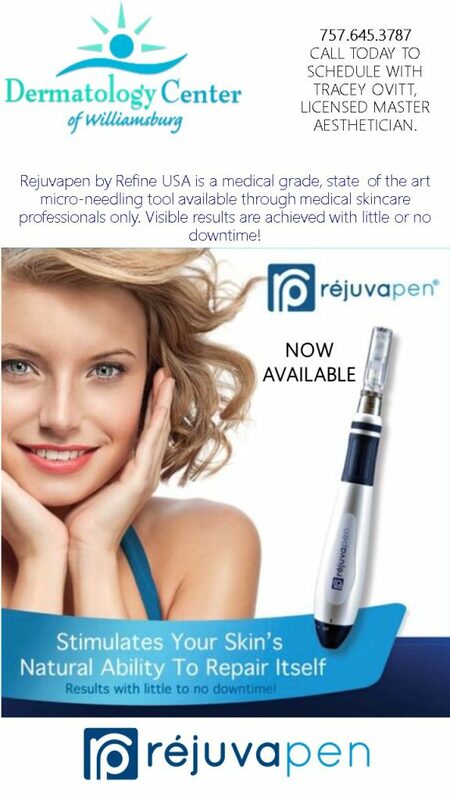 Rejuvapen by Refine USA is a medical grade, state of the art microneedling tool available through medical skincare professionals only. Rejuvapen is designed to stimulate your skin’s natural ability to produce new collagen formation creating healthier skin, and can be used to improve the appearance of acne scars, hyper pigmentation, stretch marks, skin texture as well as, fine lines and microscopic channels, which also allow products to penetrate into the deeper layers of the skin resulting in better product outcomes. One of the most exciting things about Rejuvapen is that it can be used on all types of skin. Rejuvapen stimulates your skin’s natural ability to repair itself. Visible results are achieved with little or no downtime. Call 757-645-3787 to schedule your appointment today with Tracey Ovitt, LME.